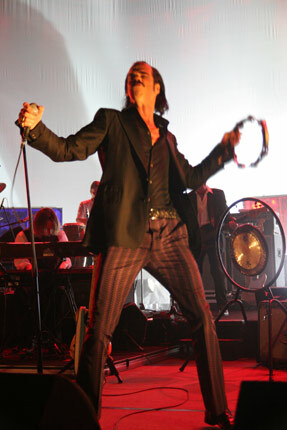 I saw Nick Cave and Co. live a few weeks ago, and they really tore it up onstage. The band is a severn-piece ensemble, featuring (among others), Warren Ellis, who is also 1/3 of the Dirty Three. I single out Mr. Ellis because, aside from Mr. Cave himself, Mr. Ellis was the most interesting to watch. When he wasn’t playing his Fender Mandocaster or strumming his viola like a guitar, he was on the floor, coaxing all manner of sounds from his effects pedals, looking like a hobo all the while, with long hair an and unkempt beard. At any rate, this is a standout track from the Bad Seeds’ latest effort. More Warren Ellis being weird and awesome. This Nick Cave is also superrad. This is my favorite song from D!!!LD!!! Bravo. This song is freaking awesome. I want Nick Cave to be the preacher at my church. Nick Cave & The Bad Seeds = amazing. If you like them, listen to the rest of the Anti- artists on their sampler. It’s great.